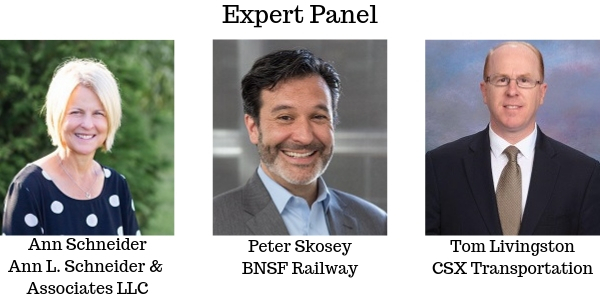 Please join us Wednesday, February 20 as we continue our 2019 programming Big Shoulders, Big Ideas with a panel of industry experts discussing the current state of the intermodal industry in the region. The discussion will address intermodal’s role in the changing economy, and implications on development and land use in Chicago and regionally. Registration ends February 14. Ann Schneider is the President of Ann L. Schneider and Associates LLC, which assists clients in overseeing transportation projects and formulating funding solutions for infrastructure priorities, which has resulted in $98.7 million in grant funding. Ann served as Secretary of the Illinois Department of Transportation from 2011 to 2014, leading the efforts to set a zero fatalities goal, create the State’s first Multimodal Freight Study and State Freight Advisory Committee. In 2012, she served as Chair of the first National Freight Advisory Committee. Peter Skosey is Executive Director of State Government Affairs for BNSF Railway, the largest freight railroad in the country. Peter has spent over twenty years working on surface transportation policy, including large scale infrastructure projects and innovative financing tools including privatization of Midway Airport and CREATE, and the passage of the Transit Facility Improvement Area and Public Private Partnerships for Transportation acts. Peter is a founding board member of the Center for Illinois Politics, Program chair for the Chicago Area Public Affairs Group and serves on the UIC Alumni Board. Tom Livingston is the Regional Vice President – Midwest Government Affairs for CSX Transportation, where he’s worked since 2003. He’s formerly held positions as the Executive Director of the Illinois Medical District Commission, and as a Senior Assistant to Governor Jim Edgar. Tom has served as the Village President of La Grange since 2013 and is the former chairman of the Cook County Forest Preserve Foundation, and the Calumet Area Industrial Commission. Please note that refunds are not available for cancellations.